The small Italian island of Capri is situated 5 km from the mainland in the Bay of Naples, a celebrated beauty spot and coastal resort since the days of the Roman Republic until now. It is also part of Campania. Capri, known in Greek mythology as the isle of the sirens, was a favored resort of the Roman emperors. Most notoriously, the emperor Tiberius had his villa on the island, the location (supposedly) of debauched orgies. Those who displeased the emperor were flung to their deaths from the cliffs. The island is world famous and is very touristy, especially when swamped with tourists in July & August, but other times of year it is calmer and more relaxing. The isle of Capri is the setting for William Somerset Maugham’s The Lotus Eater, a short story in which the Bostonian protagonist arrives in Capri on holiday, wherein he is so enchanted by the place that he abandons his job and decides to spend the rest of his life in leisure on the island. Many brand names of products are pronounced ka-PREE in English-speaking countries, but if you want to pronounce the name of the island like Italians do, you have to say KAH-pree. Capri is reached in about 40 minutes by hydrofoil from the port of Ischia or Forio, docking at Marina Grande on the north side of the island. There are also daily ferries from Naples (20/day, €16, 40 minutes), Amalfi, Positano and from Sorrento (15/day, €14, 20 minutes). Boats are operated by Caremar and SNAV. Capri Online offers information on schedule and prices for all ferry/hydrofoil to Capri. For arriving in style, Capritime Boats specialises in water taxi direct transfers from Naples, Sorrento, the Amalfi Coast and Ischia to Capri. They also provide luxury full-day and half-day boat tours to the Amalfi Coast and Sorrento Coast from Capri, tailor itineraries for cruise ship passengers docked in Sorrento, Capri, Naples and Amalfi and also offer special Capri and Ischia island boat excursions. By foot: from the main harbour to the town up the hill leads a range of stairs. Stairs and walkways, mostly signposted, crisscross the island. By funicolare: this mountain tram connects the harbour with the town up the hill. Read also about the unified public transport ticket Campania Unico. By taxi: The open top taxis are expensive but, if there are a group of you worth considering. Haggle to get a price to ferry you around the island for the day (it won’t be cheap – but very little on Capri is!). Blue Grotto (Grotta Azzurra) – The Blue Grotto is a beautiful cave at the water’s edge with a tiny opening to the sea that opens and closes with the tide, used as a bath since the Roman times. The entrance is small and depending on the tide there is just enough space for only a small rowboat to get through. Dark at the entrance, one has to enter 20-30 yards and then turn around to view the beautiful sight of the light from the entrance flowing through the water lit turquoise from below by the sun. Hence the sight of the “Blue Grotto”. You’ll be amazed at the turquoise hues glimmering in the water and against the rocks. The grotto often closes due to tides and waves, and it may take a while for your boat to get in, with many other boats trying to do the same. It may also be advisable to check the tides beforehand to avoid disappointment. The trip on the passenger boat from Marina Grande to outside the Blue Grotto cavern costs about €9, then €12.50 per person for the rowboat to take you in through the tiny entrance which includes the entrance ticket to the cave and demands forom the oarsman for a tip, with a round trip of about 1 to 3 hours. There are also cruises that circumnavigate Capri and stop at the Blue Grotto allowing passengers to board a row boat and enter the grotto Alternatively, one can take a bus to Anacapri, walking 100m (inquire locally), then taking another bus to the Grotta Azzurra. This has the advantage of cutting on the cost from Marina Grande, as well as placing you near Anacapri where much else is to be seen. There is also a trail starting from Anacapri through the woods. Use Google Map (Satelite view) to try and find the trail and there are signs located intermittently. The grotto is open from 9:00 to one hour before sunset daily. If the grotto closes suddenly (hopefully while you are outside it), consider a €12 cruise around the magnificent Faraglioni Rocks instead. The Blue Grotto is one of those ‘love it’ or ‘loathe it’ places. At peaks times the queue of tour bosats and those arriving by land can be 1 to 2 hours long and the total time in the cave is only a few minutes. Some will wonder what all the fuss is about (it’s a cave with a small pool of blue water) and will begrudge the cost and time involved in seeing it. Others adore the place. As your trip finishes, your boat rower will likely ask for a tip (as if you haven’t paid enough for the 20 min service). Villa Jovis – splendid residence of the Emperor Tiberius, start from Piazzetta Umberto I and turn into Via delle Botteghe, continuing straight on through Via Fuorlovado, Via Croce and, finally, Via Tiberio. After visiting the villa, you could dedicate some time to other attractions in the vicinity, such as the Church of Santa Maria del Soccorso, the Cave of Tiberius and the Lighthouse Tower. Sunrise – If you take the early ferry from Naples (the one at 6.45AM), then as you travel to Capri, the sun rises over the mountains. The sky turns from deep violet to pink to orange to gold. It is an amazingly beautiful sight, certainly worth waking up at the ungodly hour! Villa San Michele – Localed in Anacapri. Swedish physician Axel Munthe built it at the turn of the 20th Century on the grounds of one of Tiberius’s ancient villas. The gardens have stupendous views of the island, the Sorrentine Peninsula and Mount Vesuvius. The villa and its grounds sit on a ledge at the top of the so-called Phoenician Steps (Scala Fenicia in italian), built between Anacapri and Capri very probably by the first Greek settlers (the stairs are very steep and not for everybody). The good doctor actually wrote a book about the building of the villa and it makes good reading (The Story of San Michele). You’ll find the book in many languages at the villa gift store for about EUR 10. The Villa makes a very nice visit and along the road to get here you’ll find nice stores that sell the Limoncello liquor that is quite good (specially cold). There is a small entrance fee, but it’s well worth it. Church of San Michele Arcangelo – Also in Anacapri, this church is a very nice example of baroque style on the island. Even though the church is nice by itself, the prize is the tile floor which is a mosaic depicting the expulsion of Adam & Eve from paradise, by artist Leonardo Chiaiese. You’ll have to walk on wooden planks on the sides. Capri is a place to do as little or as much as you like. The four cafes in the main square are the place to be seen in the evenings after the deluge of day trippers have left. Celebrities can occasionally be found sipping drinks there. High end shops line the streets if you feel the need for retail therapy. Walk Take one of the public footpaths which let you reach, for instance, the “Arco Naturale” and other beautiful sights which the large majority of tourists will only see from their boat trips around the island. Some of these paths are very steep and you need to walk up and down long stairs sometimes. The map you can buy for a small fee at the main tourist office in the harbor shows most of the footpaths. However, it is difficult to get lost on such a small island. Hike Nearly the entire perimeter of the island is accessible for hiking. Few people, except local fishers and hunters, take advantage of these beautiful natural trails. Several abandoned forts are found along the path and there are trails and paved descents that can take you all the way to the water’s edge. This is a great way to explore the natural beauty of the island when the day tripping tourists flood the more populous regions of the island. Bring plenty of water and comfortable shoes if you do hike, you may be a long distance from the nearest road or bus stop. Rent a motor boat For anywhere up to 5 people per boat, you pay around 80 EUR for two hours and drive the boat yourself – the perfect way to see the island from the sea – no schedule, you can stop wherever you please to take a swim. Enquire near to the port for the companies who provide these boats. Rent a motor scooter to tour the island. Gets you around much quicker than on foot, but still allows you to easily maneuver the winding roads. Beware of crazy bus drivers especially around corners! Beware as they may only allow experienced drivers to rent scooters. Take the chairlift ride Called the Seggiovia by locals, it goes from Anacapri up to Monte Solaro. On a clear day the views over the bay of Naples from the summit are indescribable and there are some really pretty gardens and orchards underfoot on the way up the mountain (passing over private homes). The ride takes 15 minutes each way and is a remarkably peaceful break from the tourist crowds elsewhere in Capri. You’ll want at the very least 30 minutes at the top, where a restaurant and toilets are available. Round trip is €10 or €7.50 one way. Open daily in summer 9:30 to 5PM, last run down at 5:30PM, November to March last run down at 3:30PM. Very windy at wintertime. Swim, many locals swim in the Blue Grotto after 6PM when the boats stop and in any of the other grottos around the island. Swimming is much safer however at the small beach to the left of the ticket kiosk for the furnicolare in Marina Grande or on the other side of the island at Marina Piccola (resort-like beach) or at any of the natural beaches reachable by boat. Swimming in grottos is only for experienced swimmers and is not for the faint-hearted, as tidal waves frequently close and open the openings to the grottos, and in the process, potentially injure a swimmer against the rocks when trying to enter or exit. Never do this alone, go with a local if you really feel the need to swim inside a grotto or the Blue Grotto which has a very low mouth opening. Marina Piccola is on the opposite end of the island from Marina Grande. You can walk, but the bus is probably easier. The Marina Piccola is a quieter area which has two beach areas where you can swim or lay out on the smooth rock beach. But in July and August finding space on the pebbles is very difficult. Water taxi. Available also for private excursions anywhere in the Bay of Naples and Salerno. Tour. 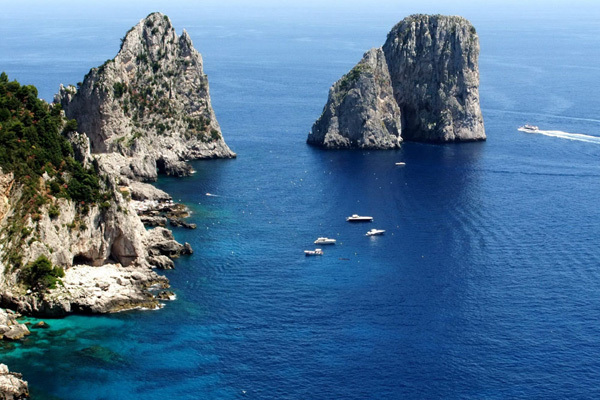 Private or Group Tours There are many tour operators that offer different tours of Capri. One of those is Visit Capri. There is a wide range of Tours you can decide to do. If you want to visit the island not on your own you can check the web site www.visit-capri.com . From April to the end of the summer, the island also comes to life from an artistic and cultural point of view. Concerts are organized almost every evening in the squares or the splendid villas built by Tiberius, as well as painting and sculpture exhibitions, plays and dance performances. This wonderful island is a destination that attracts visitors of all nationalities! Festival of San Costanzo On May 14th every year, the patron saint of the town of Capri, San Costanzo, is celebrated. Festival of Sant’Antonio On June 13th every year, the patron saint of the town of Anacapri is celebrated with a large rustic festival. International Folklore Festival During the 1st week of August, Anacapri plays host to a range of events in its squares, featuring musical bands and folk dance companies. Settembrata Anacaprese September. A large rustic festival for celebrating the grape harvest: 10 days of celebration dedicated to the island’s typical produce, including shows, competitions and games. Capri Film Festival Every December since 1991, Capri has hosted an international festival dedicated to the cinema. The event attracts Italian artistes, Hollywood stars and independent filmmakers keen to present their works in this exclusive location.